Gini Wijnaldum was on a flight this morning when he was spotted by someone who recognised him – or at least thought they did. We’ve all done it when seeing a famous person – thinking, ‘is that really them?’. But little did this fan know, Wijnaldum was watching him as he texted a friend to check! 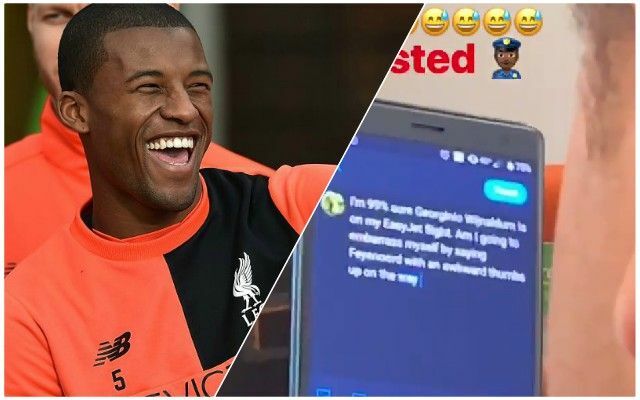 Via his Instagram story, Wijnaldum shared a video of him spying on someone’s phone as they typed out a text. Hopefully, the fan did say hello on his way past – otherwise, when he sees Wijnaldum’s Instagram story later on, he’ll be kicking himself! Wijnaldum was travelling somewhere, perhaps back to his homeland, the Netherlands, with the Reds having some time off with no FA Cup exertions this weekend. He will be back ready for the Premier League game against Leicester City at Anfield on Wednesday.